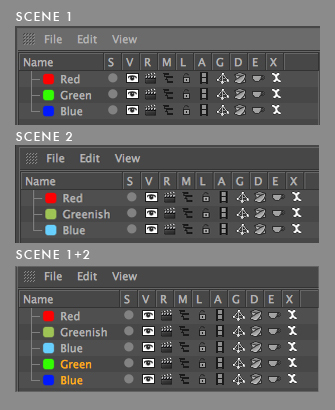 A surprising amount of people who really know their way around C4D still don’t use Layers. Perhaps there is a preconception that they are mainly for organisation, which you can do much more efficiently in the Object Manager. I’m not going to try and convince you they’re great for organisation or particularly intuitive but they are currently the fastest way to temporarily reduce calculations within your scene. 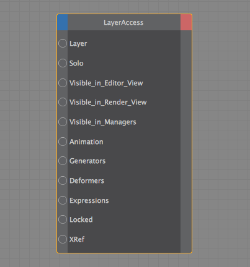 Layers allow you to switch off all Generators, Deformers, Expressions, and Animation for a specific layer, as well as hide objects in the Viewport, Render and Object Manager. When working in large scenes this is invaluable. • Holding cmd while dragging a a parent object to a Layer in the Layer Manager will assign it to all of its children as well as any assigned Tags. The cursor icon will change to a square with a cross to indicate this when you are dragging. This also works vice versa by cmd dragging a layer to the Object Manager. This is the quickest way to add a whole hierarchy to a Layer. • When copying objects that are assigned to layers to a scene that already contains layers, if the Layer has exactly the same name AND colour then they will be merged. Any other circumstance will simply add the Layer to your Manager as a new one. As you can see in the image, even though the 2 'Blue' Layers share the same name, the colour discrepancy means they are not merged. The 2 'Red' Layers are identical so are merged. There are some areas within the layer system that I wish Maxon would improve. Since initially writing this article, so many amazing people have contributed tools to improve Layer workflow. I've now kept the initial shortfalls of the native tools and also provided links to the workarounds. Donovan Keith has introduced a full suite of tools to make working with Layers easier and more productive, CV-Layer Comps. I'll explain what the plugins do further down the page, put you may as well listen and watch the man himself explain them and start the download now! There is no native way to 'Mute' a layer, only Solo one. I would prefer to have the option to kill an entire layer without clicking 8 times, as using Solo mode introduces other problems. CV-Layer Comps plugin fixes this problem, as well as the next issue that was always tied to it. Unfortunately there is no native way to have C4D automatically assign a new object to a layer. This means when working with one or more layers in Solo mode one would have to un-solo everything to add a new object to a layer and re-solo to continue working. I previously had a frustratingly awkward workaround involving a window specific shortcut but once again CV-Layer Comps has added this functionality automatically so I'd strongly recommend using that. Wunderkind Niklas Rosenstein has filled a gap with his powerful 'Layer Access' Xpresso node. It provides Input access to any layer, which means you can animate elements as well as link multiple ports to a single controller. The node is within the Xpresso Tag and using it should be very simple if you know any Xpresso. Either use the Node's attributes to control it directly or connect its ports to other Nodes ('Link' data for the Layer port, 'Boole' for the rest). I show how I use it practically in PROXY SETUPS. WARNING: CV-Layer Comp manager and NR's Layer Access Node cannot both be active at the same time or they will interfere with each other. If you want to animate Layers via Xpresso, just make sure the CV-Layer Comp manager is closed, and vice versa just disable the Xpresso tag if you want to keep switching between Layer comps manually. Hierarchy Handling: Currently you can nest layers within others, by cmd clicking an icon on the parent Layer the state will be copied to it’s children; this is useful but inconsistent with the Object Manager. For example if you turn off the visibility of a parent Null in the Object Manager, then its children also disappear unless you specify otherwise. This difference is just something to be aware of, but in my opinion should be made consistent. 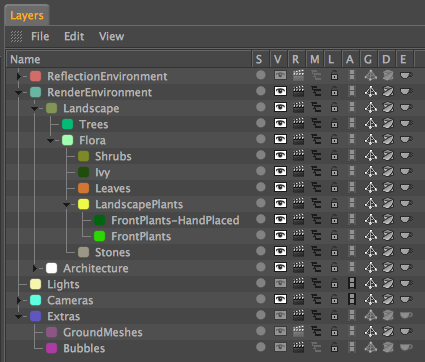 A more serious problem regarding hierarchies is when copying an object that is assigned hierarchical layers to another scene they lose all organisation and must be re-nested. 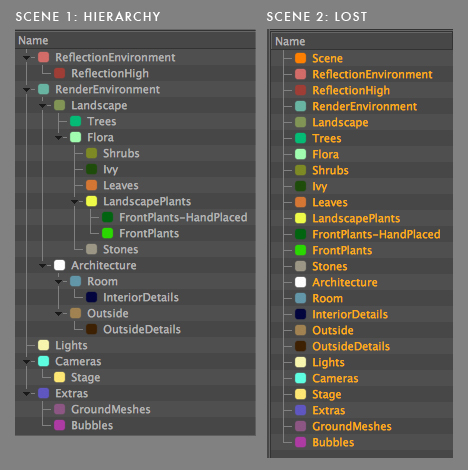 Hierarchy lost after copying objects with Layers assigned to another scene. I recently tried to make a complex setup that involved several Deformers per object, each object was then Cloned and collapsed so I ended up with a large hierarchy of heavy calculations. I tried assigning each deformer to a layer so I could concentrate on one deformation at a time. It was then I realised that Layers control Deformers slightly strangely; basically you cannot assign a Deformer itself to a Layer and turn it off via the Layer Attributes, the Layer can only control the Deformed Object. This is an anomaly and doesn't apply to Generators, only Deformers. Check out Selection Objects to read about controlling the aforementioned complex hierarchy. You may have guessed already that this has been solved by CV-Layer Comps. But there is no native way to make a selection of states and save it. · CV-Layer Comps Manager: Provides an easy interface for quickly saving and loading layer states that is similar to Adobe Photoshops' Layer Comps Manager. · CV-Active Layer: Automatically assigns new objects to the selected layer in the scene layers manager. · CV-Load Layer Comps Palette: Loads a palette containing all of the CV-Layer Comps - ideal for docking into your Layers manager. · CV-New Layer Comp: Creates a new layer comp based on the current layer states. · CV-Next Layer Comp: Activates the next selected layer comp in the Layer Comp Manager. · CV-Mute Layer: Mutes/unmutes the currently selected layer. · CV-Reset Layer to Defaults: Restores all layer properties of the selected layer to default settings. · CV-Solo Layers of Active Objects: Turns on solo mode for any layers associated with the selected layers, if other layers are currently soloed it turns them off. · CV-Solo Next Layer: Loops through all selected layers - soloing them in turn. · CV-Solo Previous Layer: Like the one above, but in the opposite direction. So as you can see, it addresses most of my most missed Layer Manager features and throws in a handful more for good measure. I think the only thing that would make this our undisputed new Layer overlord would be the ability to animate between Layer Comps so things can be turned on and off at different times while working and rendering.